The British government aims to reduce net migration from the hundreds of thousands to the tens of thousands. Charter flights are the UK Border Agency’s most draconian method of deportation, involving specially hired aircraft and over a hundred private security guards. But the Home Office’s focus on Ghana, Pakistan and Sri Lanka is inconsistent with a numbers-driven approach to immigration policy. Charter flights do not deport people to China and India, countries where most of Britain’s irregular migrants originate from. Damian Green’s claim that his Agency was responsible for planning the new wave of deportation charter flights to Sri Lanka is particularly questionable. Green made official visits to Pakistan and Ghana last year to meet their Interior Ministers before launching deportation charter flights to these countries. 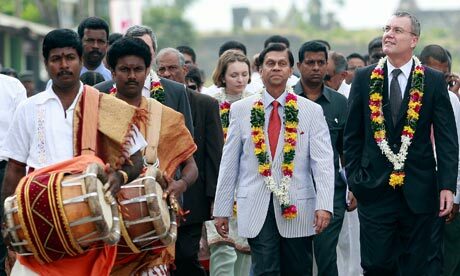 However, no Home Office minsters have visited Sri Lanka since the Conservative Party formed the coalition government. This is in stark contrast to Liam Fox, Britain’s disgraced former Defence Minster, who had an active relationship with the Sri Lankan regime. His ‘secretary’ even met with senior Sri Lankan officials to discuss deportations one week before the first charter flight left last June. My last article explored how this controversial new wave of Tamil deportations serves the Sri Lankan regime’s interests. The UK Border Agency’s claim that it is safe to return Tamil refugees bestows international credibility on a regime beset with allegations of human rights violations. The mass deportations have also intimidated war crimes witnesses in the Tamil diaspora from coming forward. This article examines Fox’s personal financial motives for abusing his public office to support the Sri Lankan regime. A fraction of Fox’s business deals were exposed in the Adam Werritty scandal last October. The Sri Lankan Development Trust (SLDT) was revealed as a mysterious Fox/Werritty enterprise which supplied £7,500 for three of Fox’s visits to Sri Lanka in 2009 and 2010 (some of which was paid for by the Sri Lankan government). In fact, the SLDT stood to gain millions in infrastructure projects, but this has so far escaped public attention. As shadow-defence secretary, Fox used a meeting with the regime in Colombo on 13th March 2009 to suggest setting up a “Sri Lanka construction fund”. At a peak in the Sri Lankan military’s massacre of civilians, Fox was planning to “help the Sri Lankan government in handling the reconstruction and rehabilitation of the war ravaged areas in the north and east [of the country]”. The Guardian was told by none other than Lord Bell, the founder of PR firm Bell Pottinger, that Fox met Nivard Cabraal, the Governor of the Central Bank of Sri Lanka, in the summer of 2010 and agreed that a ‘Sri Lankan Development Trust‘ would invest in road building and other infrastructure projects using private investment (The Guardian, 13th October 2011). The SLDT has shared offices with 3G (“Good Governance Group”). 3G is chaired by Chester Crocker, who also sits on the board of American division of Bell Pottinger. The Trust has since registered at a different address, which is also the headquarters of the British firm ‘Cairn Energy’ (The Guardian, 13th October 2011). The article omitted that Cairn prospected for offshore oil and gas in Sri Lanka as soon as the war finished in 2009. Cairn’s Indian subsidiary, Cairn-India secured the first of eight exploration blocks that the Sri Lankan regime is developing secretly. Bell Pottinger was hired by the Sri Lankan government to improve the regime’s international image after the war. As part of this marketing exercise, Bell Pottinger even arranged for Cabraal to be interviewed favourably on the BBC business channel [VIDEO, 9th February 2010]. Cabraal used the opportunity to promote Sri Lanka as a destination for foreign investment and glossed over the repression of journalists . Alistair Burt is the only other senior British politician who has traveled to Sri Lanka in this time period. Burt has been exposed as a contact for lobbyists at the notorious PR firm Bell Pottinger (TBIJ//The Independent, December 2011). 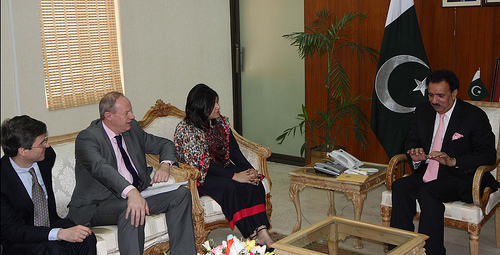 As the Foreign and Commonwealth Office Minister for South Asia, Burt traveled to Sri Lanka in February 2011 to visit parts of the war-torn north. In a video filmed near Thellipalai Junction, Burt advised “reconcilliation” between the Regime and the Tamil communities [VIDEO]. Like Fox, Burt is not part of the Home Office. However, he has refuted medical evidence which documents how the Sri Lankan regime is torturing Tamils who are deported back to the island. He insisted that “there have been no substantiated allegations of mistreatment on return” (Letter to Freedom From Torture, January 2012). Reconciliation appears impossible while the regime confiscates Tamil land. 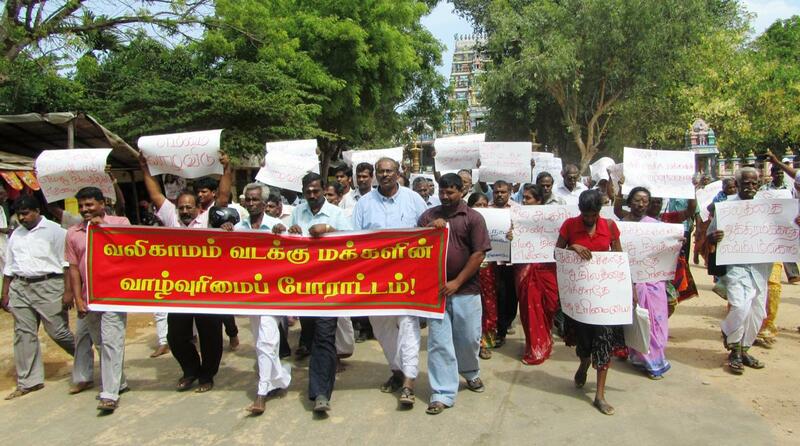 Last month, over a hundred civilians protested at Thellipalai Junction, demanding the military stop this “land grab”. One of the demonstrators, Mr Ranath, claimed the “Mahinda [Rajapaksa] regime is interested in grabbing land to be given to alien investors. They get the commission and the support to carry on” (TamilNet, 19th June 2012). Meanwhile, Liam Fox is making a visit with several other Tory MP’s to Sri Lanka this week. 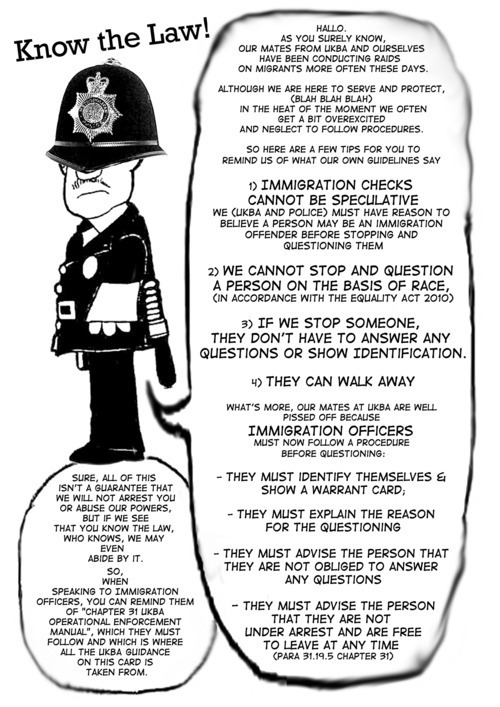 We want to tell you about something that happened on Valentine’s Day, Tuesday 14th February 2012, at Harmondsworth and Colnbrook ‘Immigration Removal Centres’, near Heathrow Airport. Harmondsworth is the biggest migrant prison in Europe, with 600 people trapped inside. Next door is Colnbrook, another detention centre with very high security, where 300 people are locked up. The prison guards tried to scare us away with their dogs. Then the police started to arrive, even riot cops. But we keep the exit roads shut for 7 hours, and shouted slogans in different languages. 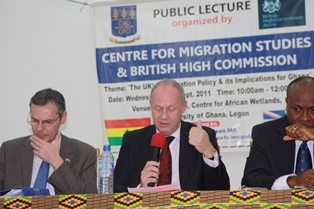 We knew of about 18 people inside Harmondsworth facing deportation to Ghana that night. The charter flight could take 50 people in total, fromall the different detention centres in Britain. The plane was scheduled to take off at midnight from Stanstead Airport, a 2 hour drive from Harmondsworth. The blockade delayed the coach from getting to the airport for several hours and caused the flight to take off late. This delay won time for more legal challenges that got at least 2 Harmondsworth detainees taken off the flight. The blockade also stopped a man being deported to Sri Lanka that evening on a commercial flight, because the Reliance prison van could not drive him to the airport. Both Ghanaian women at the Yarl’s Wood Immigration Removal Centre had their tickets cancelled through their own legal challenges. All night, we talked with our friends locked up inside, telling them what was going on outside. Detainees said they were happy there was a protest happening and thanked everyone for coming along. Organisations and individuals sent lots of messages of support. Some journalists printed stories about the blockade in newspapers like “The Guardian” and “The Independent”, and it was on the BBC. 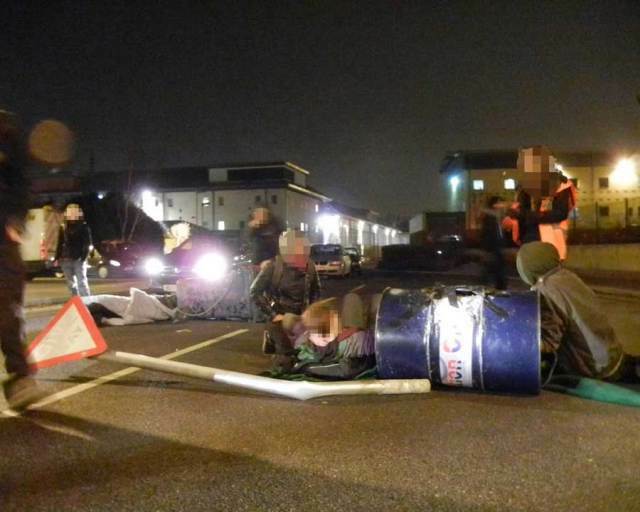 The blockade ended at 1 o’clock in the morning. The police got a special squad to cut through the concrete blocks, and then dragged the militants away. 11 of us were arrested, but 3 militants managed to escape. Then we saw the coach driving out, hired from a company called “WH Tours”, followed by 3 prison vans. We were angry and sad, even though we had tried very hard to stop it. The arrested comrades were kept in the police station for 36 hours. Supporters travelled to the court room for their court hearing. More riot police were waiting outside and made trouble for the people visiting the court room – 1 more person was arrested. Eventually, on Thursday evening, all the militants were released on bail. They have to come back to court on Monday 8th March, to face charges of ‘obstructing the highway’ (this means blocking a road) and ‘section 14’ (which is when the police try to ban your protest but you ignore them). But these charges are not serious and we think the police will lose in court. In fact, we think what the police did was illegal, and we can even take them to court. We will keep supporting the people who were taken off the Ghana charter flight. They are still locked up in these horrible detention centres, without proper medical treatment or legal advice, away from their families and friends. And as for our friends who were deported, you are not forgotten either. We hope to stay in contact and keep supporting each other. When people who get deported by charter flight work together, the resistance movement gets stronger. In some countries, like Mali and Iraq, there are associations of deported people that organise protests in these countries against deportation. These have become very successful campaigns. We can’t blockade every charter flight, but there are many different ways to fight the Border Agency and stop deportation. Our struggle continues!